Bill Jones’ detailed look at the troubled figure-skater was nominated for the William Hill Sports Book of the Year. EIGHT YEARS BEFORE Jayne Torvill and Christopher Dean performed their memorable Bolero routine at the 1984 Winter Olympics in Sarajevo, another British figure-skater had already turned the sport on its head. But where the Nottingham pair were celebrated as the nation’s sweethearts and subsequently began a lengthy love affair with the British public, John Curry quickly disappeared. When he died in 1994, the vast majority of people hadn’t heard anything from him in over a decade. Ten years later, Bill Jones produced a Channel 4 documentary on Curry, which delved into a career that had culminated in a magical two months in early 1976 when he was crowned European, World and Olympic men’s singles champion. Jones finished the film, filed away his production notes and moved onto his next project. But after his 2011 literary success ‘The Ghost Runner’ – the remarkable story of the misunderstood, long-distance athlete John Tarrant, Jones was looking for a new story. He began to think about John Curry again. He went back, dusted off the research from a decade before and his interest in the tortured soul began to grow at an alarming rate. “I was intrigued by how little we had said, really and how shallow it had gone – which is what always happens in a 50 minute film”, Jones told TheScore.ie. As much as Jones had easy access to the performances and interviews that punctuated Curry’s figure-skating career, he knew little of his private life. Then came a turning point. When he tracked down Curry’s first lover in Switzerland, he was presented with John’s voice via a litany of letters that spread across a quarter of a century. Finally, the knots began to unravel. Curry’s life was a complex mess from the very beginning. His father, Joseph, was captured at Dunkirk during the second World War and spent three years in a German POW camp before escaping. But the psychological damage of such a harrowing experience ensured he returned home a deeply troubled man. Despite owning an immensely successful business, he sought solace in alcohol and endured rather than enjoyed relationships with his wife and sons. When John was a teenager, his father was found dead in a hotel in the final days of 1965. An inquest later found he had committed suicide by overdosing on a sleeping tablet he regularly took to help with his insomnia. The acute bleakness, the melancholy and longing for escape seamlessly passed from father to son as did a litany of other eerie similarities. There was also the shame. Whereas John’s father had taken his own life – a social taboo that few understood, John himself had a secret. And by his late teens, he was struggling to come to terms with his homosexuality. It led to more isolation and the world of figure-skating seemed tailor-made for him as a result. Curry spent his entire life struggling to be understood. From an early age, he was different from the rest. He desperately wanted to dance and everything he did as a child became a routine. He even choreographed the way he’d use the stairs in the family home. But dance lessons were refused by his father, who deemed it inappropriate for the son of a wealthy, well-known businessman. Instead, ice-skating was encouraged and so began a rare thing in John’s life: a relationship that lasted. But if his abilities on ice came naturally, there were still plenty of problems. Firstly, there was his lack of interest in staying within the pre-determined confines of the sport. He wanted to push boundaries and craved creative, artistic, emotional performances. But ice-skating wasn’t ready for a revolution and Curry had to painstakingly learn the technical elements to ensure his place among the elite. And then there was his ‘way’. Coaches grew concerned over his sexuality and how it bled into his on-ice persona. Bravery followed Curry, whether he knew it or not. As a young man in London, he immersed himself in a gay scene when it was still a criminal offence to do so. Later, in the immediate aftermath of his Olympic success at Innsbruck in 1976, he spoke openly to a reporter about his sexuality and the news quickly filtered worldwide. In the early 1990s, as the virus that would eventually kill him slowly ate away his beauty, he invited newspaper photographers to come and take pictures of his emaciated body. But through all the secrets and the lies, the mysteries and the dramas, there was the skating. And despite being alone, suspicious and secretive, each performance Curry gave on the ice was akin to a journal entry. Every routine, particularly in his post-Olympic career, was autobiographical. Email “Ice, artistry and AIDS: the tragic story of Olympic champion John Curry”. 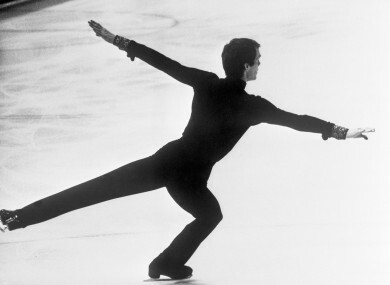 Feedback on “Ice, artistry and AIDS: the tragic story of Olympic champion John Curry”.